Foreign Minister Mevlüt Çavuşoğlu spoke at the third Turkmen Assembly General Meeting in Ankara on Thursday. He spoke about the oppression Turkmens face from Bashar Assad's regime in Syria, the Syrian PKK affiliate Democratic Union Party (PYD) and DAESH, and pledged to provide all means of support to both Iraqi and Syrian Turkmens who are escaping war zones. The meeting was attended by leading Turkmen figures as well as many academics and officials from various embassies. It began with opening remarks from the head of the Syrian Turkmen Assembly, Abdurrahman Mustafa. Mustafa vowed to continue to fight until Turkmens reclaim their freedom. The meeting was also attended by Turkmen representatives from Bayırbucak, Aleppo, Tartus, Hama, Homs, Idlib, Raqqa and Damascus. Çavuşoğlu cited the 3 million refugees Turkey has taken in from Iraq and Syria and said that 300,000 of them are Turkmens. 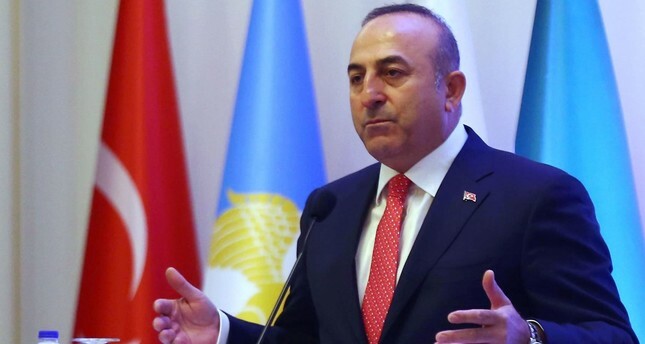 Stressing that Syrian Turkmens must enhance their activities at the political level, Çavuşoğlu said: "Political transition is a must with efforts to establish a democratic state based on the rule of law and allowing its citizens to elect their leaders in a new Syria. Our goal is to support our Syrian Turkmen brothers to have a say in their country's administration." Saying that a transition in Syria cannot happen with Assad and the "bloody-handed" Baath ideology, Çavuşoğlu also called on Turkmens from various regions of Syria to unite. Mustafa said: "As the council enters its fourth year, we have encountered much suffering, including 35,000 deaths, and many have been exiled from the land where we lived for thousands of years." Asserting that Syrian Turkmens face extinction, Mustafa said: "While the murderer [Assad] regime aims at Turkmens with all its force, terrorist organizations such as ISIS [DEASH], the PYD, [its armed People's Protection Units] YPG and others have missions to banish the existence of Turkmens." He said the situation in Syria has evolved into a serious global war; claiming that "there will not be a Syria without Turkmens and there will be no Middle East without Turkey." Syria has been locked in a vicious civil war since early 2011 when the Assad regime cracked down on pro-democracy protests with unexpected ferocity. Since then, more than 250,000 people have been killed and more than 10 million displaced, according to the U.N. The population in northern parts of rural Latakia, called Bayırbucak by Turkmens, is predominantly Turkmens, who have suffered from constant Russia-backed regime attacks since November 2015, causing thousands to seek refuge in Turkey's neighboring Hatay province. A 2015 Amnesty International report said the YPG carried out forced removals of Arab and Turkmen populations in northern Syria. The report said that the crimes committed by the YPG amount to war crimes and that non-Kurds, mostly Turkmens and Arabs in villages in the de facto autonomous Kurdish administration, have been forced from their homes.